Motorola LS1203 Bar Code Reader [LS1203-1AZU0100SR] - $181.25 : Dealpops.com, Good deals are keep popping up! "Manufacturer: Motorola, Inc Manufacturer Part Number: LS1203-1AZU0100SR Manufacturer Website Address: www.motorola.com/us Brand Name: Motorola Product Model: LS1203 Product Name: LS1203 Bar Code Reader Marketing Information: The LS1203 Bar Code Reader from Symbol Technologies delivers high quality laser scanning, user-friendly ergonomics and durability at an affordable price. Designed to meet the needs of small businesses, the LS1203 provides the performance and features needed to significantly reduce data entry errors and boost productivity day in and day out in gift shops, boutiques, sporting goods, jewelers, video stores, florists and other small local retailers. Easy and comfortable to use, this high-value cost-effective scanner offers the reliability and investment protection that have made Symbol the global leader in handheld bar code scanning. 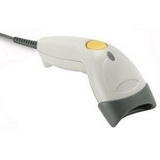 Product Type: Handheld Bar Code Reader Connectivity Technology: Wired Image Sensor: Linear Scan Rate: 100 scan/s Host Interface: Multi-interface"